I've said it MANY time before, but I want to make sure everyone hears it this time! WE LOVE HAIR BOWS. Very much. Every day Avery has something pretty in her hair. When I received this pretty little number. From Chic Clips, I was EXCITED to get it on Avery and see how it looked. Although I didn't get pictures. BAD MOMMY I know! But it's so pretty. So much ribbon went into making this bow and it took her a lot of time and I know that. 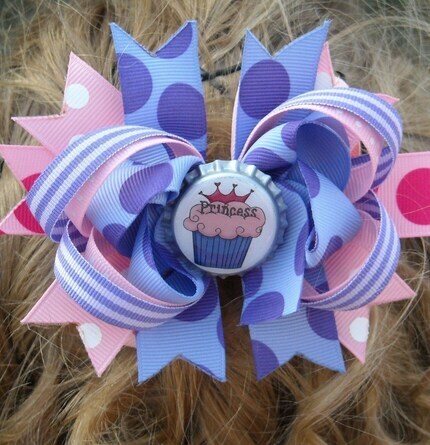 I make bows myself so I can only imagine how long it would take her to make this Beautiful Birthday Princess Cupcake bow. It's just gorgeous! An HUGE. She's got some gorgeous bows from the Euro Bows like I received which are multiple bows in one, To the Boutique Bows, to the Flowers. They are all just divine! She's got a LOT more bows listed on her Etsy. Price: These beautiful bows range from $4-$6... with a few exceptions. I know how expensive that ribbon can get so I say this is a GREAT price! Overall: ***** Great momma to work with and just an awesome all around company. She puts so much time and effort into each one of her bows. I would get the fuschia gerbera daisy with bling, watermelon boutique bow and the sweet ladybug birthday bow! I like the lets monkey around birthday bow. I like the Monkeying around bow. CUTE!! Cute! I'd get the green & brown polka dots, the light pink bling daisy, and the classic miss mouse clips! I would get the Strawberry Chocolate Euro bow and the Pink Swirls Boutique bow. I love the pinkalicious Euro bow and the pink ladybug bow. I would get two Chocolate Strawberry Euro Bows. Heart Sprinkles in Red & White, very cute! I would get the Ice blue and white boutique bow!